It seems like every design house has tried their hand at producing a car of their own. Bertone did it a couple of times, Ghia did it for most of the 1960s, and even Pininfarina got in the game in the 1980s. But nobody did it smaller than Zagato with their Zele electric car. Built between 1974 and 1976, the rear-engined, rear-drive Zele was available in three models, the 1000, 1500, and 2000 – all so-named for their motor wattage. In all, about 500 were made. This is an early 1000 watt model and these all sported a 50 mile range. This model has only covered 99 km in its life. That’s just over a single charge! This two-seater – in correct original orange paint with black stripe (one of seven original colors available) – was originally owned by another Italian company that worked in the electric car field. It should sell for between $14,500-$17,000. Click here for more info and here for more from this sale. 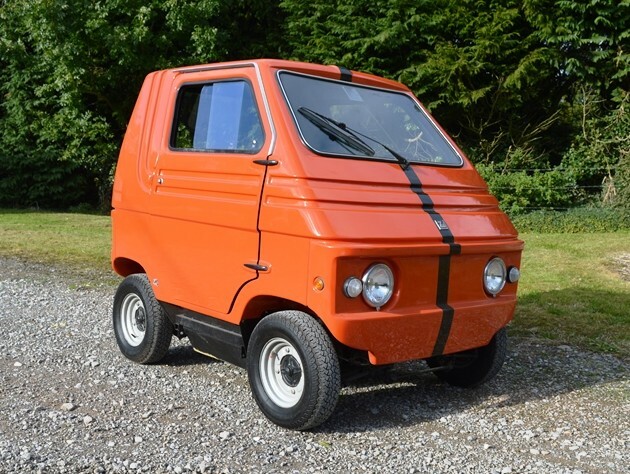 This entry was posted in Uncategorized and tagged 1000, 1974, auctions, cars, classic cars, historics at brooklands, microcars, zagato, zele by classiccarweekly. Bookmark the permalink.